More than 22,000 elderly people in nursing homes are being given powerful sedatives for no medical reason, it has been claimed. A report by the Liberal Democrats suggests residents who do not need these drugs are being kept sedated to make life easier for staff. Its health spokesman Paul Burstow said the situation may be even worse in residential homes. "Quite simply the over medication of older people is abuse," he said. The report's figures are based on a review of British and international studies in this area and information released to parliament. It is the Lib Dems' second report on the issue. According to Keep Taking the Medicine 2, up to 22,233 elderly nursing home residents are being given powerful anti-psychotics without medical grounds. It suggests that another 32,000 elderly people in residential homes may also be at risk. The report points to an increase in community prescriptions for antipsychotic drugs - up 6.2% between 1999 and 2002, an increase of 129,000 prescriptions. It also shows that two out of three GP practices have missed a government target to introduce six-month reviews of medication for all over 75s. These reviews were supposed to have been up and running since April. Mr Burstow called for tougher action to tackle the problem. 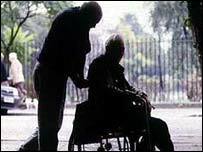 He wants tighter checks on care homes and a new criminal offence of neglect of a vulnerable adult. "Despite mounting evidence that older people are the victims of a chemical cosh in care homes, minister's have failed to get a grip on the problem. "With serious shortages of specialist staff and little chance of attracting more, the evidence is that care homes are turning to chemical cocktails to make residents easier to manage," he said. "It can result in death and it denies older people their dignity." The Department of Health said care homes were required to keep "meticulous" drug records on every resident. "If an inspector from the National Care Standards Commission finds evidence of over-prescription or maladministration of drugs, they have a duty to report such evidence to the police and the professional bodies of those involved for further action," a spokeswoman said. "We are aware of concerns about the overuse of antipsychotics for older people, particularly those in care homes. "Since March 2001, as part of the National Service Framework for older people, doctors, pharmacists and other health care professionals have been implementing a medicines management programme where medication is regularly reviewed to ensure that people receive the right medication." However, the National Care Homes Association dismissed the claims. "I find these figures very surprising," a spokeswoman told BBC News Online. "Care homes don't prescribe drugs. Doctors prescribe drugs. If the Lib Dems are saying these drugs are being prescribed for no clinical reason and just to make the life of care home staff easier then it is doctors that need to be called to account."